This post is the first in the series called Piece x Piece, where I experiment with creating a capsule wardrobe by remixing the clothes I already own. I’ll be sharing my findings over on Instagram with the hashtag #PiecexPieceCapsule, along with a few recap posts here on the blog. Capsule wardrobes have a tumbleweed effect for me. And not in the way you’d expect, where I’ve tried it once and I’m hooked. Here’s the thing: I’ve actually talked myself out of trying it dozens of times. You see, ever since moving from NYC to Colorado, my spending has drastically decreased on clothing. It used to be all too easy to wander into Madewell on Fifth Ave during lunch and come home with a bag full of goodies. Time to kill before dinner with friends? That’s ok, I’ll wander into J.Crew, too. Bad day? Time for some retail therapy. It was when I started prepping to move that I started to see the problem. I had more clothes than it made sense to pay to move, having worn very few of them on a regular basis (we all have our favorites right?). I would walk bag after bag to the donation stall at the farmer’s market each Saturday, and still, I was left with a hefty collection of clothing. But when I moved, things started to change. Shopping was no longer as accessible. It required more planning and driving — two things I wasn't willing to put effort into at the time. So I decided to wear what I had. I don’t think I bought any clothing that first year in Colorado, working mostly from home with few people to impress and still adjusting to the variable income inherent in freelancing. But fast forward to more recently, and there are days when I blankly stare into my closet before a client meeting or a night out, and think that I’m in desperate need of a refresh. A capsule collection, I think, that will do it. I begin to online shop, opening tab after tab of brands that I’ve been meaning to try, filling my carts with anything that looks cute, telling myself I’ll narrow it down later. This isn’t the point of a capsule, I tell myself. You don’t need 43 completely new things! And so I shut my laptop and put it far, far away — where I won’t be tempted to buy myself a completely new wardrobe, closing the door on the idea of a capsule once again. Why the long backstory? Well, I can’t imagine that I’m the only one that feels this way. 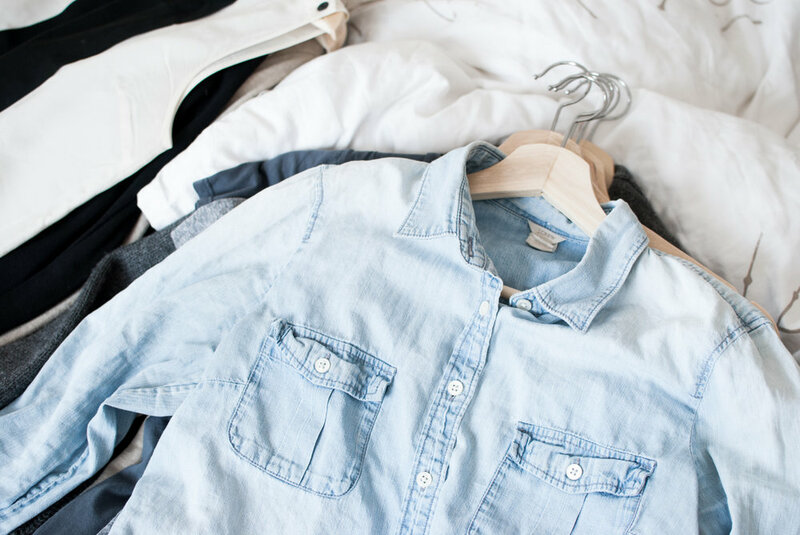 I have no doubt that a capsule wardrobe can be a powerful tool, but the prospect has always seemed overwhelming to me for the reasons that I’ve just described. I plan to share my outfits and findings over on Instagram with the tag #piecexpiececapsule, with a few recaps here on the blog as well. I’m a true believer in the process of refinement. I’m hoping that by narrowing my closet in this way, I’ll have an easier time filling my wardrobe with pieces I truly love and parting with those that I don’t. I’m looking for a stronger sense of my personal style to come forward. I’m aiming for quality over quantity. Fewer pieces means that I can take time to research and invest in each one as they’ll (hopefully) be replaced less often. There are so many smaller companies out there doing truly incredible things in the slow fashion industry. I’d like to learn more about these businesses and aim to put more of my money toward supporting them. Running a business certainly comes with its fair share of decision making, so I’m all for systemizing where possible. I’m hoping that by cutting down the possibilities in the morning what to wear will be one decision that comes a bit easier. This doesn’t include workout wear, underwear, pajamas, or cocktail attire (I may tackle this as a separate capsule at some point, but for now those are a beast of their own.) I'm still toying with the exact number of pieces in my winter capsule, but I'll keep you posted in my next post. Pick a number that feels right. If an item you wear constantly is getting worn out, you’ll need to replace it, so be sure to consider that in your 3-5. I decided this wasn’t an exercise in deprivation, so I left these numbers vague enough so that I could get a fresh feel, but not so broad that I would have an entirely new wardrobe. Think under-bed storage or at least move it to the other side of the closet. This part has always tripped me up in the past. A large motivation behind this experiment is to spend less time getting ready in the morning, and make one decision just a little bit easier each day. Clearing out the clutter is key to doing that. And that’s a wrap! Be sure to check back to see how my winter capsule shaped up!